In the last few months, we've seen numerous acts of politically motivated or targeted violence. Some of these cases have been plastered all over the news for days or weeks. Some others have been met with deafening silence. And which is which hasn't exactly been random. There is clear bias in the reporting of political violence and I believe this has had some serious consequences for people's ability to trust the media and bridge a divided culture. October 2018: Trump-supporting lunatic Cesar Sayoc, Jr. attempted (but completely failed to) to deliver (non-functional) bombs to over a dozen Democratic leaders including Obama, Clinton, Maxine Waters, and Eric Holder among others. As we learn more about this story, it becomes increasingly clear that Sayoc has a long history of threats and violence going back to at least the mid-90s. October 2018: Anti-semite Robert Bowers shot and killed 11 people and injured 6 others at a synagogue in Pittsburgh, and although he seems to have been anti-Trump, the Anti-Defamation League (ADL) has already blamed Trump for creating the environment that encouraged Bowers' actions. October 2018: Another man with a substantial history of mental illness and violence, Gregory Bush, entered a Kroger grocery store in Jefferstown, Kentucky and essentially executed a 67-year old man named Maurice Stallard with a handgun for no apparent reason, after which he exited the store and shot and killed another woman, Vickie Lee Jones (67) before he was challenged by another shopper who drew a legally concealed weapon and shot back at him. Bush apparently attempted to enter a church nearby before he went to the Kroger, presumably with the intent to kill. Although there is currently no motive known, many people assume Bush was motivated by racism because he is white while his two victims were black and one witness recounts hearing him say "Don't shoot me and I won't shoot you. Whites don't kill whites," to the man who confronted him. October 2018: Envelopes testing positive for Ricin (an incredibly dangerous poison for which 22 micrograms/kilogram of body weight constitutes a lethal dosage) were sent to Secretary of Defense, Gen. James Mattis. April 2018: Self-described "Incel" Alek Minassian drove a van into a crowd in Toronto and killed 10 people. Incels are considered "right-wing" although "Involuntary Celibacy" is mainly a reaction to feminism and has no inherent connection to right/left politics. August 2017: Neo-Nazi James Fields killed Heather Heyer and injured 19 others with his car at the Charlottesville "Unite the Right" rally after he drove through a crowd of protesters. What you probably don't know is that his trial is set for November, and he was recently assaulted in prison. October 2017: Stephen Paddock opens fire on a crowd of country music fans in Las Vegas from his room on the 32nd floor of the Mandalay Bay Hotel, killing 58 people and causing injury to 851 others either directly or via the resulting panic. This was the deadliest mass shooting in US history, and yet no motive is known, little information has been released to the public, and the press coverage died out relatively quickly. I'm including the Las Vegas shooting in this list because it sparked another national gun control debate, this time over whether or not it should be legal to own bump stocks. You'll probably also have heard about a number of cases of street violence involving the "Proud Boys", and perhaps you might have recently learned that Facebook shut down that group's main page. And you'll have probably heard of various racist/anti-Semitic threats and acts of vandalism against Jewish community centers, churches, and other political targets, which are often assumed to be a product of Trump's rhetoric. October 2018: Ricin envelopes were not just sent to James Mattis, but also to President Trump, along with Senator Ted Cruz and Chief of Naval Operations Admiral John Richardson. The FBI arrested a suspect in Utah, William Clyde Allen, believed to have sent all the packages in a coordinated effort. Allen confessed to sending all four letters, but we also learned that—similar to the inoperable bombs allegedly sent by Cesar Sayoc, Jr.—none seemed to contain actual Ricin, but rather castor seed from which Ricin is made. October 2018: In Las Vegas, a Democratic activist working for American Bridge 21st Century named Wilfred Michael Stark assaulted Kristin Davidson, campaign manager for Nevada's Republican gubernatorial candidate, Adam Laxalt. Stark had previously been arrested for similar activity at a GOP rally in Virginia. October 2018: In Minnesota, Republican state-representative Sarah Anderson was chased and punched by a man ripping up GOP campaign signs, and two days earlier, Republican candidate Shane Mekeland suffered a concussion after being punched in the back of the head while having dinner at a local restaurant. October 2018: The Republican Party Headquarters in Manhattan, New York was vandalized with spray-paint, smashed windows, and a threatening notethat read: "Our attack is merely a beginning. We are not passive, we are not civil, and we will not apologize." October 2018: Jackson Cosko, an intern working for Democratic Senator Sheila Jackson Lee was charged by the United States Capitol Police with "doxxing" Republican Senators Mike Lee, Orrin Hatch, and Lindsey Graham. While doxxing itself isn't violence, it has frequently led to serious harassment and violence as people have access to personal information such as the home addresses, phone numbers, and email address of the victims. October 2018: Florida man, Jame Royal Patrick, Jr., was arrested for making death threats to people who supported Brett Kavanaugh's nomination to the Supreme Court. October 2018: Shots were fired at the Republican party campaign office in Daytona Florida, breaking the windows. Fortunately, no one was in the office. October 2018: A hairdresser Jordan Hunt starts an argument with a female pro-life demonstrator in Ontario, and after a few minutes of conversation roundhouse-kicks her in the face on camera. September 2018: GOP campaign offices in Laramie, Wyoming, were set on fire by arsonists. The same thing happened in Hillsborough, North Carolina, back in 2016, so this is nothing especially new. September 2018: In San Francisco, a man named Farzad Fazeli attempted to stab Republican campaign worker Rudy Peters with a switchblade while he was working at an election booth at a Castro Valley town festival. July 2018: Martin Astrof was arrested for threatening to kill GOP campaign staffers and President Trump. July 2018: Someone vandalized the Lincoln, Nebraska (my hometown) GOP headquarters by smashing its windows with a brick and spray-painting "ABOLISH ICE" on the sidewalk. August 2017: Missouri lawmaker, Maria Chappelle-Nadal, said on social media that she hoped President Trump would be assassinated. She later was formally censured by the Missouri State Senate. October 2017: In Alexandria, Virginia, James T. Hodgkinson (a Bernie Sanders fanatic angry with the results of the 2016) died with a list of Republican targets in his pocket in a shootout with police after he shot four people: lobbyist Matt Mika, legislative aid Zack Barth, Capitol Police officer Crystal Griner, and Republican Congressman Steve Scalise who nearly died. The shooting took place at a baseball diamond where several Republican Senators and Congressmen were practicing for the annual Congressional Baseball Game for Charity. Another thing you might not realize is that many of the skirmishes involving the Proud Boys group were actually caused by Antifa and Democratic Socialists of America activists—though you'd hardly know it from the way most reporters frame these events—and Antifa social media pages have not been shut down. Comparing media coverage between Antifa and conservative groups is, I believe, particularly instructive. Almost a year ago, YouTube commentator Matt Christiansen called attention to the differences in a video he made about Dartmouth professor, Mark Bray (talk at UC Berkeley). Bray is the author of Antifa: The Anti-Fascist Handbook. 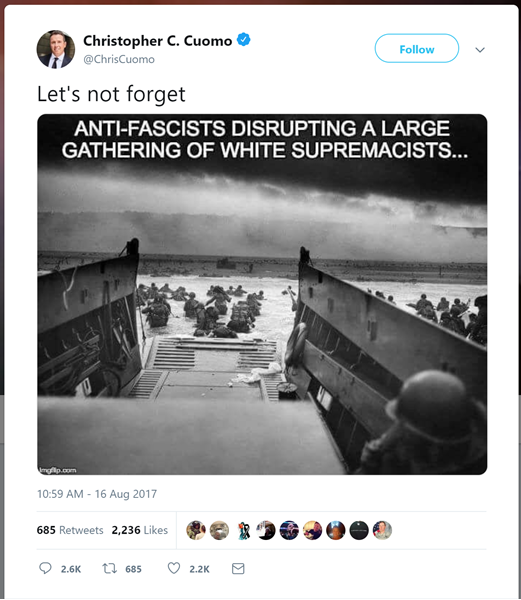 Christiansen points out that although most news media routinely and uncritically report the claim that nearly all examples of modern political violence are instigated by groups like the Proud Boys, alt-right ideologues, or actual neo-Nazi and white supremacist groups like the KKK, there have been numerous examples of Antifa violence which have not had anything whatsoever to do with protesting "fascists" or any kind of right-wing activity at all. For example, the recent takeover of multiple streets in downtown Portland, Oregon, or any of numerous examples of Antifa members attacking journalists. What's more, over the past 4-5 years there have been dozens of examples of left-wing protesters using violence to shut down mainstream conservative (or simply non-progressive) speakers like Charles Murray, Ayaan Hirsi Ali, Ben Shapiro, Dave Rubin, Milo Yiannopoulos and others. Yet no organized conservative group attempted to prevent Mark Bray from speaking. His talk—which explicitly defended Antifa's use of violence in the face of right-wing speech on the basis that allowing such speech could lead to fascism—was not silenced anywhere in the United States. Meanwhile, many people who have never called for or defended any kind of violence have been subject to aggressive "no platforming" protests which have included substantial property damage, death threats, and physical assaults. Somehow the supposed "fascists" are generally allowing other perspectives to be heard while the "anti-fascists" are not only attempting to violently silence the most abhorrent voices but also thoughtful academics, journalists, and non-political commuters. We rarely hear this discussed in major media, and Antifa is frequently presented as not only well-intended, but actually heroic. It's fairly clear that this is tremendously one-sided. I'm mainly talking about this because the way this stuff is reported drives me insane, and it affects us all in really important ways. Mass media essentially determines which of these examples of politically-motivated violence are important and worth talking about, and which are not. If the news that gets reported doesn't bother to tell readers and viewers about angry left-wing lunatics who assault Republican campaign workers, set fire to GOP offices, or shoot Republican congressmen, and if reporters and pundits don't care to spend much time writing about a series of threatening letters testing positive for ricin poison or threats of and/or the actual attempted murder of Republicans over their political views, then the people who consume news will not know about those kinds of things. And of course, this would be fine if reporters and pundits did the same thing whenever a right-wing lunatic did something insane. But that's not what happens. Most of the mainstream media (arguably with the support of all of the major social networks and even Google) devote tremendous attention to every instance of right-wing violence while utterly ignoring comparable cases coming from left-wing perpetrators. 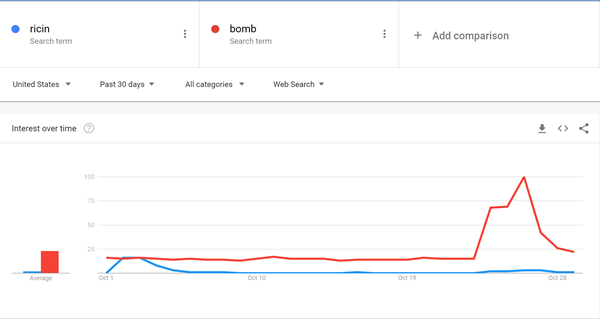 As a result, it's difficult for the average person to know what's actually happening in the world, and they end up with a completely one-sided understanding of the current state of political violence. 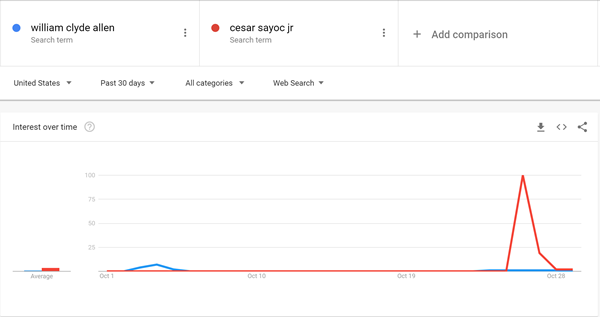 We can see what people are hearing and talking about illustrated clearly by looking at Google Trends, and as you can see below, vastly more people heard about Cesar Sayoc and the pipe-bomb scare than they did William Clyde Allen's ricin letters - although, again, both were targeted towards major political figures and both should have been treated as deadly assassination attempts until the ineffectiveness was confirmed. This bias also makes it easy for political partisans to split themselves into bubbles that each have entirely different sets of facts. Liberals/Progressives will hear of every instance of someone who could even remotely be considered "right-wing" doing anything wrong yet remain entirely isolated from the slightest hint that people who share their ideology have ever done anything wrong at all. Conservatives are in a slightly better position—in that it's nearly impossible to avoid hearing about right-wing political violence—but the more social media dominates people's information streams, the easier it is for them to similarly wall themselves off from information that makes them uncomfortable. Point is, there are legitimate reasons for everyone to be seriously concerned with the quality of reporting that we normally see with respect to this kind of activity. 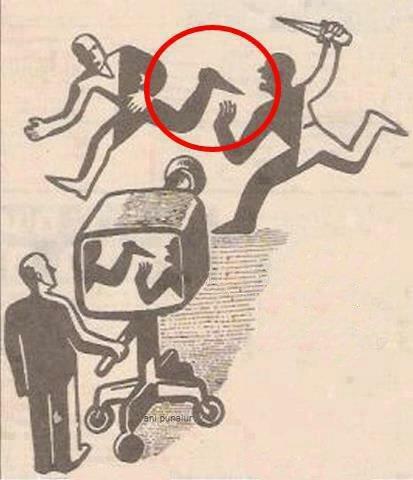 Part of being well-informed is being able to put things into context and gain a meaningful perspective, and that can only happen when you have all the information, not just half of it as we so often get. Only getting half the story makes it easy to blame your political opponents for everything that's going wrong in the world, but it's also a mistake. If Trump—for example—is to blame for people like Cesar Sayoc, Jr.'s failed bombing spree, is Bernie Sanders to blame for James Hodgkinson? Is Maxine Waters responsible for Farzad Fazeli? Is Hillary Clinton, Tim Kaine, or Eric Holder the cause of arson and vandalism in Wyoming? If you think that Trump's rhetoric is causing right-wing violence, surely it stands to reason that the similarly heated rhetoric coming from the other side is to blame for the left-wing variants of these kinds of crimes? Of course, if you only ever saw one side or the other, it would be extremely easy to think that the only people who are out there doing terrible things are your political opponents, and from there you can concoct a grand theory as to why based on how evil the other party is without much challenge when another possibility is simply that it's the individual criminal who is responsible for their own actions. There's another problem here, as well. When mass media displays such a clear bias—and please make no mistake, whether fully intentional or not, that's exactly what this is—then the people who are on the losing end of that bias are not going to be happy. And since they're actually justified in their complaints, it's very easy for them to convince people who have less skin in the game that media isn't trustworthy as well. All this does is push people further to the extremes, which makes it easier for the biggest lunatics to find reasons to believe even crazier conspiracy theories and find reinforcement for their belief that violence is the appropriate response. I want this to stop, and while there's no magic bullet, I don't think that can happen until the reporting on these kinds of subjects gets a lot better and more people are more fully-informed about everything that is going on in our world—not just the parts that confirm partisan biases.